Fire Damage is a long process and Orange Restoration gives you an overview of procedures and processes to help you restore fire damage and repair your property and assets. Fire Damage can happen at any time. Once the fire trucks are gone, your journey is just beginning. That’s because your home almost certainly suffered smoke and fire damage as well as possible water damage. But the professionals at Orange Restoration have the skills and equipment necessary to restore your house to the way it was before the fire. • Emergency response. When you make your call to us, the restoration process begins. Our customer service representative will ask the right questions so that we can respond quickly and bring along the right resources and equipment. • Inspection and assessment. We inspect the impacted area and adjoining rooms to find out the extent of the soot, smoke and other fire damage, then we can develop our plan of action. • Securing the structure. Preventing further damage is essential, so we take immediate action to board up broken windows, shore up damaged walls and put tarps over damaged sections of the roof. • Water removal. When water damage is present, we immediately start water removal. Dehumidifiers and air movers are used to get all the water from your home and complete the drying process. • Surface soot and smoke removal. Using special equipment and time-tested techniques, we get rid of soot and smoke from the ceiling, all walls and other hard surfaces. • Cleaning and disinfecting. Restorable items require cleaning and sanitizing. A variety of cleaning products and techniques are used to accomplish this as appropriate. This process includes odor removal using foggers and industrial-strength air scrubbers. • Restoration. Getting things back to normal is the final step in the process. This can involve small repairs, drywall replacement, new carpet installation, painting and more. Major construction may sometimes also be required. Call Orange Restoration Today for Fire Damage Repair in San Diego! In need of some major or minor restoration work? Time is of the essence to avoid further damage! Call Orange Restoration right away and we’ll have specialists give your situation a thorough inspection with cost-effective recommendations. 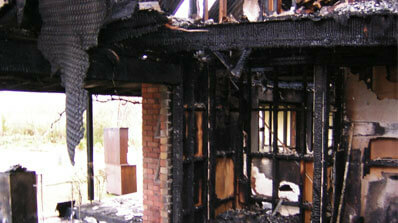 All of our technicians are fully certified and trained in all facets of fire damage restoration. We will respond quickly and get your property back to its original state in no time at all. We are available for 24/7 emergency services. Give us a call today!